Christmas time at MZS; a moment of spirituality – W.A.P. Thanks to Max IAØMZ who has taken a break to walk to the site where the statue of the Virgin is looking at the Italian Mario Zucchelli Station (MZS). We wish some better location for the Mother of Lord, perhaps one day …who knows, someone will turn our dream into a reality and we’ll have a small Chapel at the Italian Scientific site in Antarctica, where to thank God for protecting us. … more than 20 years ado, the Alpini Corp, when the chief of operations in Antarctica was the ex-Colonel (now General Retd) Mauro Spreafico, made a small altar beneath a rocky outcrop where they put a small statue of the Virgin who had brought from Italy and there, used to meet the Madonna in prayer …. She is always there, for many years now, under a rock. 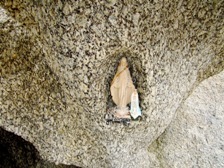 Pictures show the the Virgin on a hand made cavity at MZS and the Italian Antarctic Base shown from the rocky outcrop where the Virgin stands.